US hardliners criticized President Obama over his State of the Union speech in which he reiterated his willingness to “give diplomacy a chance” to work with Iran over the burning nuclear issue. The American leader, while acknowledging the difficulty of the ongoing talks with Tehran, said he would veto any new sanctions bill that Congress sends to his desk. "For the sake of our national security, we must give diplomacy a chance to succeed," he told lawmakers on Tuesday. Iran has denied it is attempting to develop a nuclear weapon, saying its nuclear research is geared toward the civilian sectors of energy and medicine. Obama, who said he was “clear-eyed” about the standoff with the Islamic Republic, spoke about Iran joining the “community of nations” in the event that the negotiation process turns out successful. "If Iran's leaders do seize the chance, then Iran could take an important step to rejoin the community of nations, and we will have resolved one of the leading security challenges of our time without the risks of war," Obama said. If John F. Kennedy and Ronald Reagan could sit down and talk with the Soviet Union, then surely America can negotiate with “less powerful adversaries” today, he reminded. On the same day that President Obama was delivering his State of the Union speech in Washington, former CIA chief David Petraeus was in Israel where he indicated that the United States would use military force against Iran. “Take yes for an answer. This is not an off the cuff comment. He [US President Barack Obama] has articulated his approach on the Iranian nuclear program many times,” Patraeus said at the Institute for National Security Studies’ (INSS) annual conference in Tel Aviv. While saying there is a general “wariness” among Americans towards overseas military interventions, Washington has not ruled out the military option. “We are embarked on more nation-building at home for sure, there is wisdom in that, but people should not mistake that for the ability or willingness of the US to protect its vital interests,” Petraeus said. 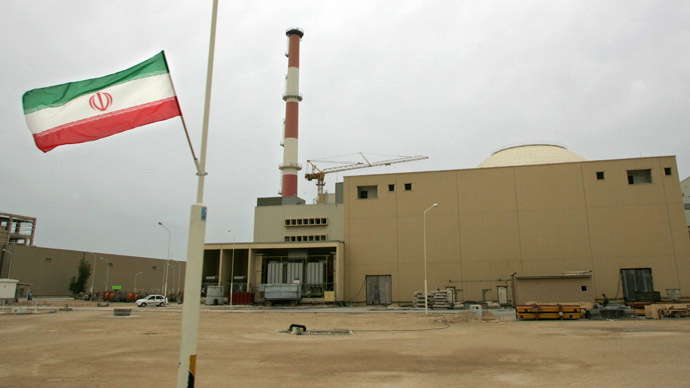 Tehran agreed in November to fulfill the demands set forth in the Geneva talks, which reduces its uranium enrichment to 5 percent - far below what is necessary to construct a nuclear bomb – and stopping its most powerful centrifuges. It has also agreed to international monitoring of its nuclear research facilities so as to prove that it is not backsliding on its promises. In return, the United States, Britain, Germany, France, Russia and China agreed to ease around $7 billion of sanctions against Iran as negotiators work toward a final settlement. Meanwhile, Obama also said he "will be the first to call for more sanctions" if Iran is found to be in noncompliance with the deal. And to sweeten any potential deal, Iranian President Hassan Rohani this month attended the World Economic Forum in Davos, Switzerland, where he emphasized his country’s economic potential despite being isolated from the rest of the world for many years. Many countries view Iran as an untapped market for future investment, as business leaders from around the world stream into the islamic country even as the ink on the Geneva agreement has not yet dried. However, bipartisan politics in Washington threatens to scuttle the deal as the Republicans have pounced on Obama’s willingness to bargain with the Iranians. "The American people — Democrats and Republicans alike — overwhelmingly want Iran held accountable during any negotiations," Sen. Mark Kirk, R-Ill., said after Obama concluded his speech. "While the president promises to veto any new Iran sanctions legislation, the Iranians have already vetoed any dismantlement of their nuclear infrastructure," Kirk added. Others, however, have warned on the dangers of missing an opportunity to avoid a possible war by ruining the diplomatic process with new sanctions. “The President of the United States, together with the State Department, have made a considerable effort to show members of Congress that new sanctions right now would be destructive to the diplomatic process,” Reza Marashi, of the Iranian American Council, told RT. In the event that a new sanction regime is enacted against Iran as the diplomatic process is bearing fruit, “it would show the international community that the problem lies primarily with Washington as opposed to Tehran,” he said. Marashi expressed reservations over the use of sanctions against Iran. Meanwhile, there are numerous economic incentives for the two sides to reach an agreement. For more details on the future potential of the Iranian economy, see report by RT's Irina Galushko. Rohani emphasized at the economic forum in Davos his country’s economic potential despite being isolated from the rest of the world for many years. “Iran’s economy has the potential to be in the top-10 within the next three decades – a goal I pursue through wider planning of social, economic as well as wider domestic and foreign policy,” Rohani told the assembled political and financial elite. Given the lackluster economic performance across the world, Iran’s offer of economic incentives may be just the key to avoiding another military conflict in the Middle East.